Baby Brands Direct’s range of weaning products has everything a consumer could be looking for to aid that transition from breast milk to adult food. Retailers can obtain supply of baby products including baby food feeders, food storage pots, weaning utensils, weaning and feeding cutlery, snack pots, baby bibs, weaning bowls, plates, cups and sets as well as food processors. As an award winning wholesaler, our inventory consists of leading and trustworthy brands like Munchkin, Annabel Karmel, Nuby, Tommee Tippee and Philips Avent and many other experts in the industry. These brands invest heavily in research and innovation, creating products that are design to fit perfectly in those little hands and help them with their movement and successful transition to self feeding. One of the prime reasons for the sector’s progress is the fact that nowadays moms are 50 times busier and do not have the cooking skills that women did when baby food was introduced 80 years ago. Another major factor is the baby healthy eating trend that has been quickly developing throughout 2015. 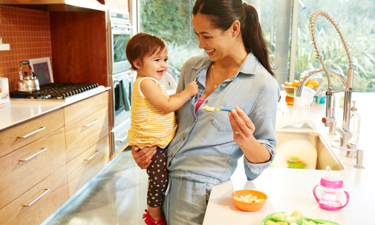 Parents and especially moms prefer home-made and healthy food choices for their babies. Therefore, they buy functional devices that can fit their lifestyles and needs. Baby Brands Direct gives you the opportunity to capitalise on this trend via offering you a portfolio of products which fulfil the whole feeding routine. Discover the bestselling items in a wide range of designs, colours and shapes.